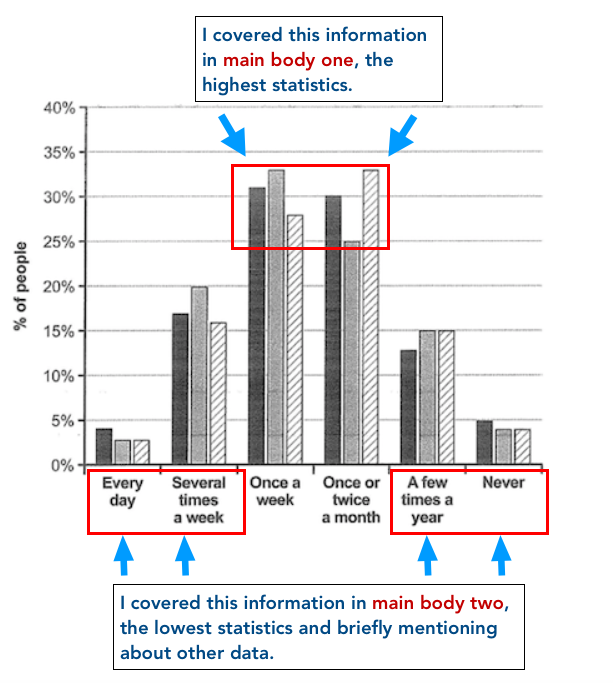 Long reports over 200 words are not necessary and could lead to more mistakes. 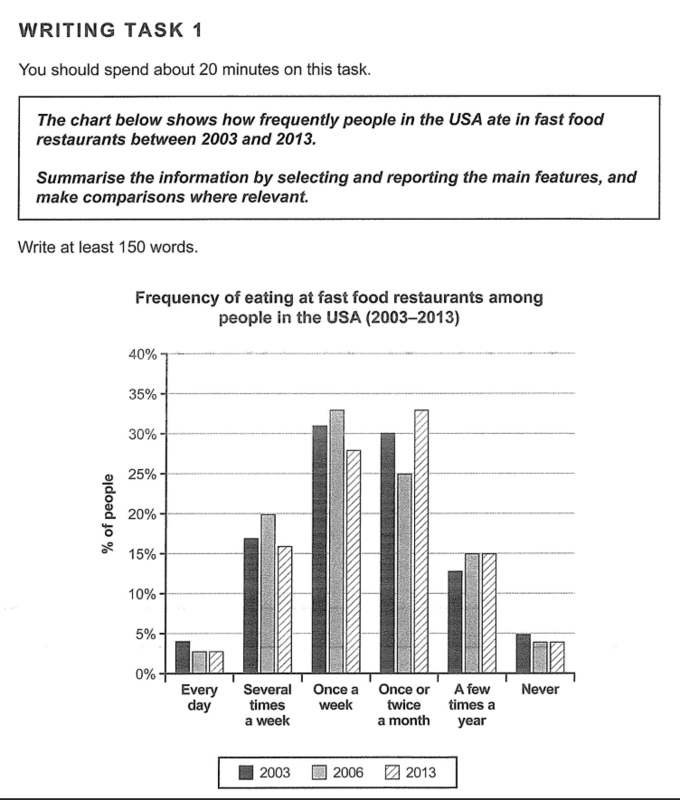 If you can paraphrase the statistics using fractions then that can help with your vocabulary score. There’s more about this at the end of this lesson. Pick out the key features and cover those. The introduction just simply rephrases the task question, the Overview should never contain numbers or data, just summarise the key features. Write logically without any opinion and no conclusion is needed, make sure you have clear paragraphs, skip a line between them. The chart illustrates how often people in the USA went to fast food establishments from 2003 to 2013. Overall, people who ate in fast food restaurants once a week and once or twice a month accounted for the highest percentages, whereas people who either never ate in these restaurants or went every day, showed the lowest figures throughout the whole period. In 2003 the number of individuals who ate in fast food establishments once a week and once or twice a month accounted for 31% and 30% respectively. 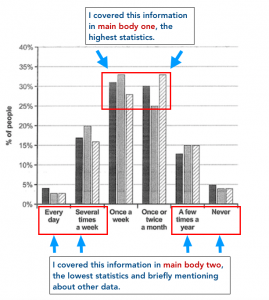 For those in the once a week group, this figure increased slightly but then dropped to around 27% in 2013. The once or twice a month category declined to 25% then rose to approximately 33% by 2013. Conversely, the figure for people who either ate at fast food eateries everyday, or never, stood at under 5% throughout the ten year period. The several times a week category accounted for 17% in 2003, rose in 2006, settling back to around 16% in 2013. The few times a year group rose slightly levelling off at 15% from 2006 to 2013. Click here for a lesson on the language of trends and how to use prepositions. The number of people / cars / houses / pets / books …. and so on. In the task question it states: ‘The chart below shows…’ this can be written as ‘The chart illustrates…’ do not paraphrase the word ‘chart’ or ‘graph’ and remember that not everything has to be paraphrased when writing the introduction, yes you can keep some words, trying to change every single word adds to your stress and may lose you marks. There are no percentages here and no details are needed. I have used the phrase: ‘throughout the whole period’ to show the time frame. I used superlatives to show the main features: The highest percentages / the lowest percentages. Notice the conjunction ‘whereas’ to show contrast between the two. Punctuation is important also as the examiner will be looking at how it is used. 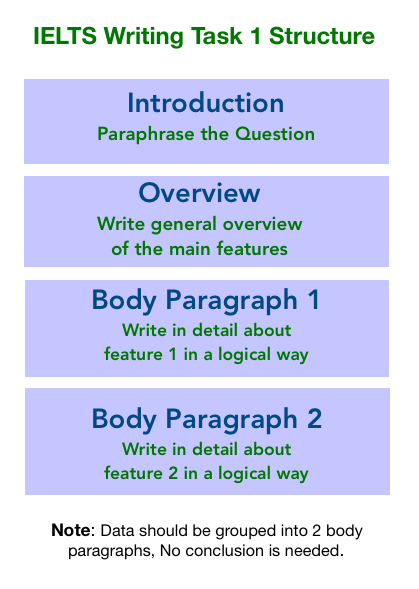 It is important to write in a logical way in IELTS academic writing task 1. Grouping the information helps the examiner follow your points easily and helps your overall coherence and task response score. Be selective here and do not write about every single piece of information, keep it concise. Notice that I have mentioned all the categories here, For a good task response score you have to cover the whole task but at the same time not go overboard with detail. Keep the word count below 200 words. There are other ways to write about statistics such as using fractions or the language of approximation. This will help your vocabulary score if you can vary the way you report on the numbers. Note: Be careful here because these fractions below are out of 100%, in the bar graph task in this lesson the percentages are out of 40% so this can be tricky to paraphrase.